As a volunteer or leader for your non profit, you may be doing your research and education to uncover the best new, innovative ways to increase revenue and attendance for your fundraising events. But let’s not forget tried-and-true methods that should continue to be an integral part of your event preparation. These three tips were offered by The Fundraising Authority in its August 14, 2012 e-Newsletter, and republished by Animal Shelter Fundraising in their newsletter published Sept. 25, 2012. 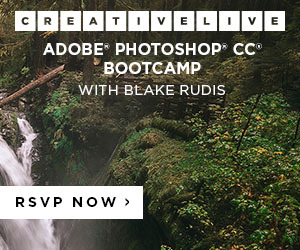 Yes, you should send out event invitations. Yes, you should send out sponsorship letters to prospective sponsors for the event. Yes you should use PR, your e-mail newsletter, and every other method at your disposal to raise money for your fundraising event. But, the most powerful weapon in your arsenal is… the phone. Many non-profits that would never think of trying to run a $500,000 major giving fundraising campaign without making calls and doing face-to-face meetings will none the less try to raise the same amount for an event simply by sending out letters and invitations and doing a nice event sponsorship package that gets mailed out to donors. Don’t make this mistake… treat your event like you would a capital campaign. Start with your prospective sponsors, and after you send out a letter, do calls and one-on-one meetings. Then move to your prospective event guests – target people who could buy whole tables and/or sell 5 or 10 tickets to the event and give them a call or go see them at their office. 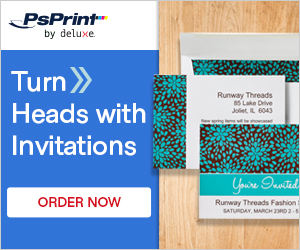 Pick up the phone and use it to generate revenue for your next fundraising event. Most non-profits know the importance of putting together a host committee for fundraising events, but very few put together event committees that really move the revenue dial. Instead, many organizations end up with a committee that spends all of its time discussing the menu and the floral arrangements, and then at event time asks for a discount on the ticket price for host committee members. Without fail, the organizations that hold the biggest fundraising events (in terms of net revenue, not attendees) put together host committees comprised of supporters (a) who understand that this is a fundraising event, and the job of the committee is to raise money, and (b) who “own” the event, taking personal responsibility for meeting the event fundraising goals by working hard to sell sponsorships and tickets. If your organization isn’t putting together host committees like this, now is the time to start. This year, for your next event, try to start adding committee members who will own the event, and make it clear to the entire committee that meeting the event’s fundraising goal is priority #1. 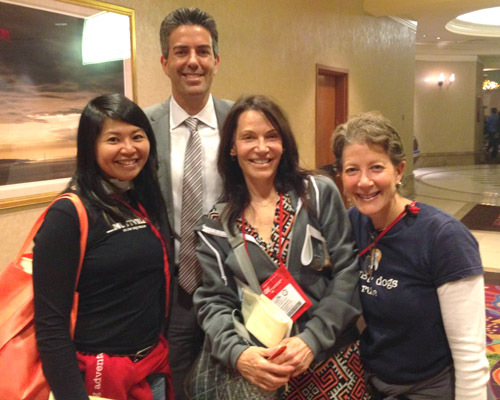 The success of an annual non-profit fundraising event grows over time. If attendees enjoy themselves at your event this year, you can be sure that they come to the event next year and will talk about it with their friends and colleagues, some of whom will likely attend as well. As the years go by, your event gets bigger and bigger, and in turn, you are able to raise more revenue with each succeeding year. A great way to accelerate this process is to make sure your organization does at least one really remarkable, water-cooler-gossip-worthy thing at each event. This could be an simple as having a local celebrity attend as a surprise guest, or as complicated as renting out the next-door pub for an after-party at your annual young professionals event. Whatever it is that you decide to do, doing something really remarkable will get people talking about your event – and in turn, will make more people want to come to your event next year. 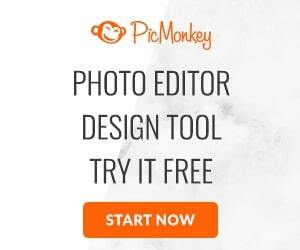 14,000+ Weekly Visits to Your Website. Realistic Goal? YES! These are real weekly stats received by Muttville Senior Dog Rescue. On average, Mutville’s website receives 10,000 to 20,000 visits per week. It fluctuates depending on the time of year, news coverage, fundraisers, events, or campaigns under way. 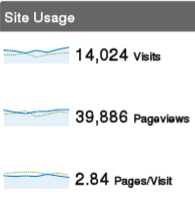 Muttville’s website launched 5 years ago, and has steadily received this level of traffic for the last 3 years. Blogging: Muttville posts 2-3 times a week. Every blog is shared on Facebook, Twitter, and Pinterest. Twitter: Muttville tweets every blog post, event, and dog profile as soon they are published. Profiles are retweeted until dogs are adopted. Facebook: Muttville posts every blog post, event, and dog profile on Facebook as soon as they are published. They also have a custom Facebook tab with all links back to the website of each dog available for adoption. 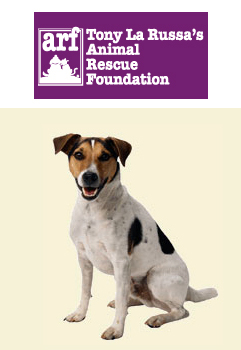 They also have custom tabs with links to various website pages: Give, Adopt, Foster, Volunteer. YouTube: Muttville has accumulated a pretty decent library of videos. In November, we were pleased to have a new volunteer who studied film, and was interested in producing our very own Holiday themed video. Starring Muttvillle mutts, it was entitled “A Christmas Tail”. It launched December 22. By New Year’s Day, it had over 4000 views. Muttville plans on producing a documentary style video and a few more fun short films in 2012. A special video is produced every year and premiered at the annual fundraiser, Moolah For Mutts. This year’s video was called “Suma’s Story”. Social Responsible Sites: Muttville is a beneficiary of various revenue-generating services, like KarmaWell, Rally.org and Causes.org. Participating on sites like these not only earns donations to non-profits like Muttville, it also offers a valuable Marketing opportunity for non-profits to share their missions and causes to new audiences. Other Social Media: Muttville also uses Digg, Foursquare, Instagram, as well as countless shares to other sites, thanks to our supporters and volunteers. Inbound Links: These are some of the highest sources of traffic. These sites posts Muttville’s dog profiles of adoptable dogs: The Shelter Pet Project, Petfinder, Dogtime, PetBond, Adopt-A-Pet. 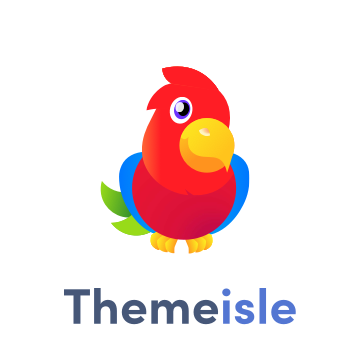 Weekly, these sites provide about 50% of the total site visitors. If you didn’t know the importance of effective inbound links, here are shining examples. Businesses can create similar traffic through affiliate marketing programs. Email Marketing: Many Muttville supporters came to know this organization to adopt a dog or simply to offer a one time donation. Muttville continues to show gratitude to every supporter with on-going communication through email marketing efforts. Often times, the subjects of our newsletters are happy and positive, to share a success story from a fellow adopter, to share a personal heartfelt thanks from our founder, and sometimes to celebrate special occasions with our pets. Once a year, the efforts are focused for the annual Matching Grant Fundraiser. Contests: Muttville enters many contests every year. 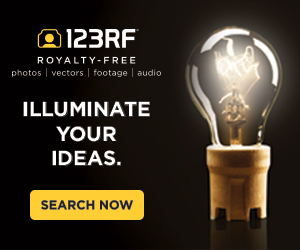 The benefits are plenty – a chance to repurpose excellent collateral – videos, photos, and advertisements – produced by professionals (all volunteers). 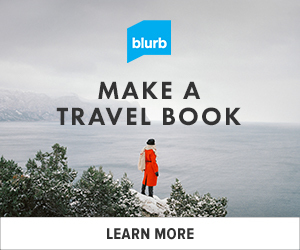 The marketing and promotion efforts for the call-to-action (i.e. votes or FB likes or watching a video) are shared with the company or business sponsoring the contest; it is a great excuse to team up with supporters; and the actions can be done by anyone who has access to a computer. Of course the biggest benefit are the prizes. This past year, Muttville won these prizes as a result of winning or placing in various contests: a new Toyota Sienna, thanks to the Toyota 100 Cars For Good contest, SF Giants star pitcher Tim Lincecum promoted a Muttville dog and spent time taking photos and video, thanks to popchips, a $10,000 grant and the title “San Francisco’s Favorite Charity” by 7×7 Magazine, and a $5000 grant from Sliderocket. Weekly Outreach Events: Every Sunday and many Saturdays, Muttville has outreach events at retail locations, outdoor city locations with heavy foot traffic, and even their own established “pup-up store”. 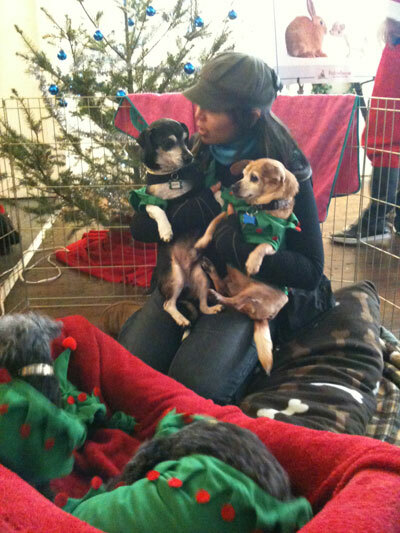 For two months, Muttville occupied a former retail store in San Francisco and held adoption events on Saturdays an Sundays all December and January. It was perfect timing for the holidays. 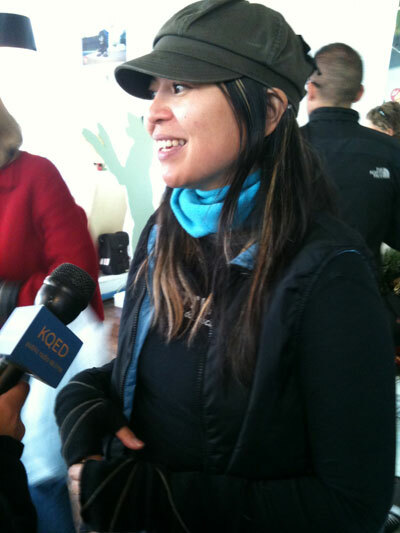 Later this year, Muttville will have a permanent location on 16th Street near Florida St in San Francisco. Speaking Engagements: Sherri Franklin is known as an expert in senior canine care, and she has over a dozen speaking engagements under her belt, not to mention countless interviews for radio, TV and news. Speaking for various organizations and fundraisers has created widespread awareness of Muttville’s senior canine cause. News and Radio: Publicist Patty Stanton takes every accomplishment Muttville achieves and announces it to every media contact she knows. Plus, as Patty taught me, every accomplishment is a big deal if you make it a big deal. 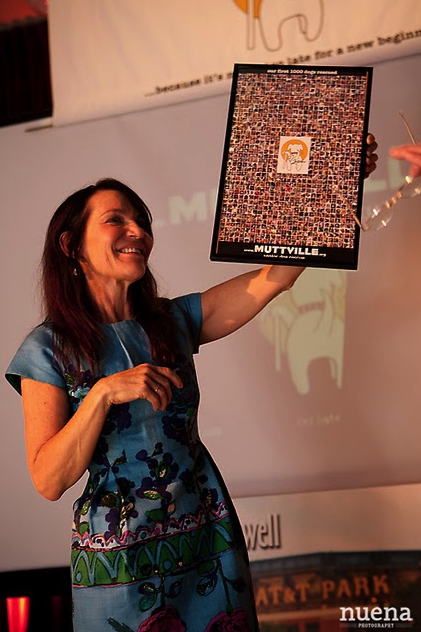 Socially Responsible Businesses: Similar to socially responsible websites, Muttville is always honored to be the beneficiary of a fundraising event hosted and organized by a business that supports Muttville’s cause. Muttville shows its gratitude by cross-promoting these businesses and including the events on our website’s calendar, which always is posted to Muttville’s Facebook wall and tweeted to our twitter followers. All these efforts are donated by volunteers. If you don’t have staff, try interns and students help get you started on a few of these tactics. Or give Switchblade a call! A special day for Muttville Senior Dog Rescue, July 1, 2012, will go down in Muttville history for a once homeless senior dog named Timmy. A week ago he was an abandoned stray. Last Sunday, he became a star! The chosen, long haired mutt now had a special advocate helping him find a new home… SF Giants star pitcher, Tim Lincecum! 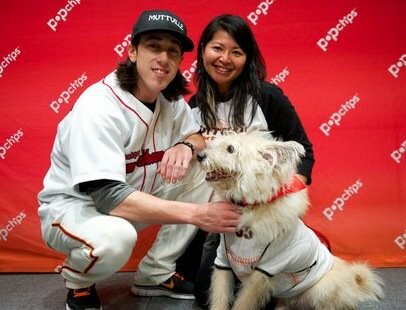 I was truly honored to be one of the four Muttville representatives to meet two-time Cy Young award winner Tim Lincecum. He was a genuine, down-to-earth, animal loving gentleman that won our hearts. And we believe Muttville’s senior dog cause won Tim’s heart. 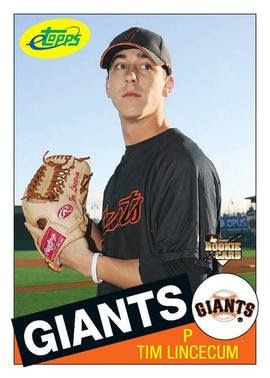 I created three items for this special day: a unique Timmy baseball card (shown on left), reminiscent of one of Tim Lincecum’s Topps cards ; a 40-sec video that was played on the Giants jumbo screen(! 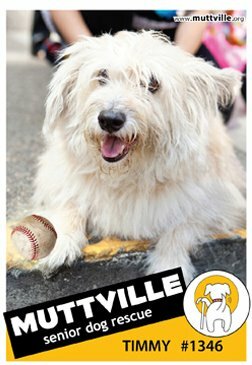 ); and a Limited Edition Muttville baseball tee in Giants colors, worn by our proud Muttville volunteers. We gave one to Tim, too. I hope he wears it!! 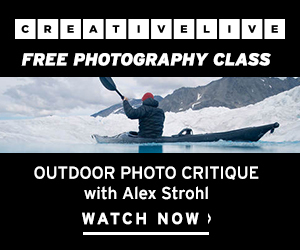 Marie Featured in Grouchy Puppy’s “Influencing Positively” Interview Series! Read the original article on Grouchy Puppy’s website. Marie is the owner of Switchblade Creative Studios, a design and marketing agency that specializes in working with nonprofit organizations and socially responsible businesses. She also co-manages Small Club, a walking/boarding/daycare service. With Muttville Senior Dog Rescue, Marie volunteers as a foster caregiver, outreach member, and the team leader for marketing & design, and social media. 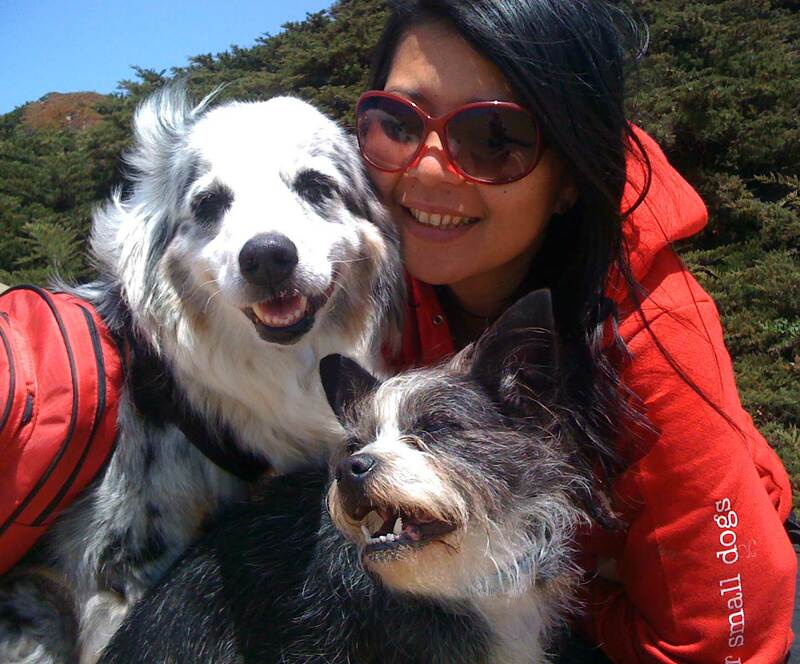 For San Francisco Animal Care and Control, Marie offers support as an Animal Caregiver and provides Marketing and Social Media services. 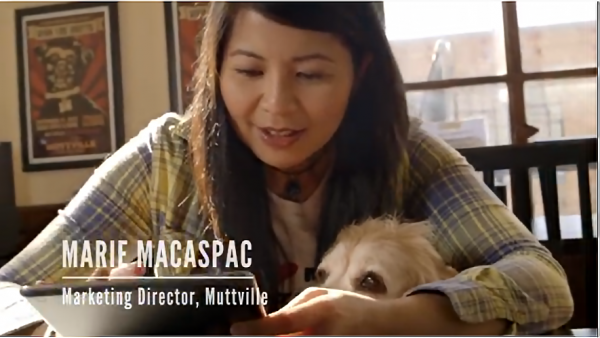 Marie Macaspac’s passion is an inspiration to many within Muttville Senior Dog Rescue and beyond. 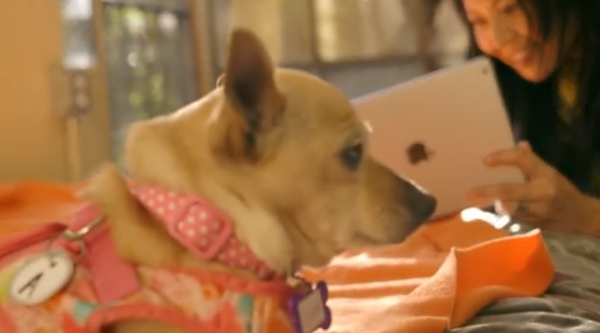 She gives her time & talent helping unwanted senior dogs find homes. By fostering more than 40 dogs in her own home as well as offering care and shelter for foster/hospice dogs whose end is near, Marie’s heart is huge. Marie is a designer and is responsible for the accolades Muttville receives when our marketing efforts are noticed – Muttville’s website, the design of Muttville’s shirts, postcards/posters announcing an event, the concept for an event, and the design of the fast-growing Facebook page – these are just a few examples. She team leads the Marketing volunteers, overseeing video production, photography production, working with other people who give their marketing talents so that older dogs can be re-homed. What is your pets most treasured possession? my dog, ocean, who is an aussie, values most…being in school! yes, she absolutely loves to be in class. she values above all things learning new tricks and being helpful. I guess on that note, if she had to love a possession, she loves to wear her backpack! she carries muttville cards, my keys, her leash….and she feels like she is doing good and being helpful, which ultimately is what makes her happy. Your proudest achievement so far? The first thing I think of is how much I love being a foster mom. I’ve proudly fostered over 40 dogs to date. Even when I think about it, I can’t believe it! And along with that experience, I value so much what I have learned hospicing dogs with cancer. Even though it was heartbreaking when I lost Collette (read my story of collette), everything I learned about helping dogs with cancer is a gift, and I have since been able to offer guidance to other hospice parents, Muttville mutts, and doggy moms and dads with their cancer dogs. Who are your heroes in real life? When I was 6 or 7, I loved James Herriot who wrote All Creatures Great and Small, and then when I was 10, I discovered Jane Goodall and I have been a fan ever since. I never dreamed that I would work side by side with anyone as amazing as them, and here I am today – working with Sherri Franklin, who has changed the future for thousands of senior dogs as a result of founding Muttville Senior Dog Rescue. I am in awe of all I have witnessed these last 5 years, and so honored to be a part of it. 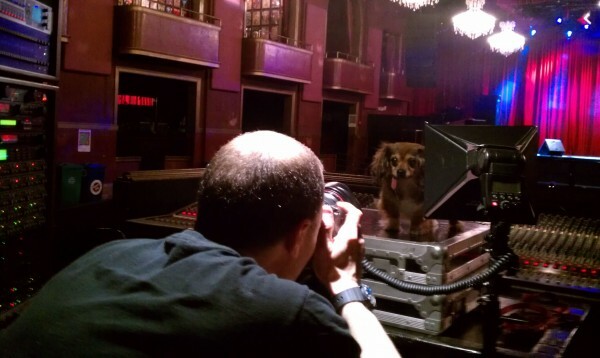 Senior Dogs Rockin’ Photo Shoot at the Fillmore! Thanks to Pet Food Express, Muttville Senior Dog Rescue got a very special day at the famous and historical music venue The Fillmore for a fun “music-themed” photo shoot. The photos will be showcased at this year’s 2012 San Francisco Pride Parade, where Muttville mutts and volunteers will be cruising their Muttmobile, a 2012 VW Beetle given to them by Oprah Winfrey, and special guests Jane Wiedlin and Gina Schock of The Go Go’s are joining them to support senior dog rescue. 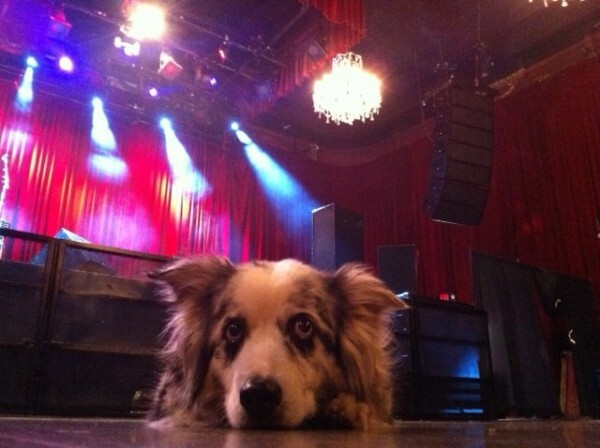 April 17 was a FUN day with music, mutts, cameras, lights, and…THE FILLMORE!! Muttville Senior Dog Rescue teamed up with Pet Food Express for a special series of “My Mutt” photos, and will be showcasing them at this year’s SF Pride Day parade and future events thereafter. Model senior mutts Pepper (parents Jen and Steph), Ruby and Scrabble (mom Yoko), and Misty K (dads Joe and Rafael) took over The Fillmore and did their best rockstar poses. Photographer Mark Rogers made sure they were in their best light. Fillmore crew Tony, Deanne, and Amie made sure the venue was set up with the same rockstar treatment that every band receives who graces the stage. They offered delectable treats in the green room to keep them energized. The Humane Society of United States hosted their annual Animal Care Expo this year in Las Vegas last week (May 21-24). Representing Muttville Senior Dog Rescue, I attended with Muttville founder Sherri Franklin and Muttville’s publicist and Board Member Patty Stanton, and we were ready to soak up all that we could learn in two and a half days about animal care education. In comparison to the Best Friends Animal Society “No More Homeless Pets” Conference in October, this conference was geared more towards SPCAs, municipal shelters, and human societies across the nation and internationally. We met an organization from Guatamala, and rescues based in the U.S. that rescue animals from Iran and Romania. It was interesting to venture outside of the Marketing track and learn about fundraising techniques and business organization topics. 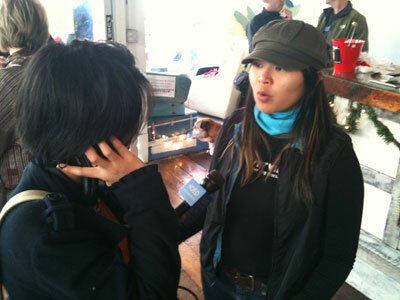 Found Animals talked about their venture in retail, opening a store in Southern California in a mall. HSUS’ session on hosting an Adopt-A-Thon was very useful, and we are currently implementing a few new ideas learned as Muttville gets ready for Maddie’s Matchmaker Adopt-A-Thon, coming upon June 9-10. Keep an eye out for some unique promos from Muttville! As a result of what we learned at the Animal Care Expo, Switchblade plans on expanding Muttville’s retail ventures, which can potentially be an effective revenue stream. On the retail topic, we were all wearing our Muttville and “Senior Dogs Rule” gear, which drew in quite a bit of attention, including some heartfelt tears from folks who were touched by our “senior rescue” focus. Three women from Puerto Rico approached me after a session, and they wanted their own “Senior Dogs Rule” tees! It is always inspiring to be in a room full of animal advocates. Patty and I are always thinking ahead, and next year we hope Muttville can participate with some sessions on senior animal care (there was none this year). What do you all think? Nashville, here we come!